Cello Renda is back in business . . . at last. Peterborough’s top professional boxer is to fight in an English super-middleweight title eliminator in September at the Doncaster Dome against Luke Crowcroft. And the bout, on September 1, will arrive a year after Renda’s last contest when he beat former Posh favourite Leon McKenzie to win the Southern Area super-middleweight crown. That was a brutal battle at York Hall in London which ended in the ninth round. 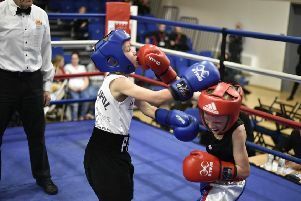 McKenzie looked on course to win on points but succumbed to a barrage of punches in the penultimate round from 43-fight veteran Renda, who at 32 was seven years McKenzie’s junior. McKenzie lay on the canvas for several minutes after the fight and oxygen was administered to the footballer-turned-boxer who was taken to hospital in an ambulance as a precautionary measure. McKenzie announced his retirement from the sport the following day. The manner of that victory, says Renda, frightened off potential challengers. “I’ve been avoided since winning the Southern Area title and it’s been very frustrating for me . . . all that training with nothing at the end of it. Crowcroft, who actually comes from Doncaster, is 10 years younger than Renda and has won 10 of his 13 fights. Renda, who has won titles at three different weights, says he will be favourite. “On paper you have to have me down as favourite but forget what it says on paper because paper is for teachers,” he said. “On a serious note I do have more experience. I’ve had more fights, I’ve been in with the better opposition and I know what it’s like in the trenches.